CoreBrake™ Clamp-on muzzle brake is designed to reduce felt recoil, eliminate muzzle rise. 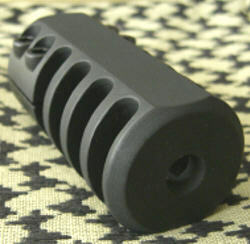 The clamp on muzzle brakes are designed to fit any rifle without threaded barrels at the muzzle. They are manufactured with very precise tolerances to be Clamp-on and then fastened with quad locks. The quad bolts ensure a tight and secure clamping to the barrel. Our four chamber clamp on muzzle brakes deliver substantial improvements over other after market models. In addition to reducing the felt recoil by over 45%, the primary advantage of our muzzle brake is the reduction in muzzle rise. Design efficiencies have allowed for a faster target acquisition where muzzle rise is virtually eliminated. 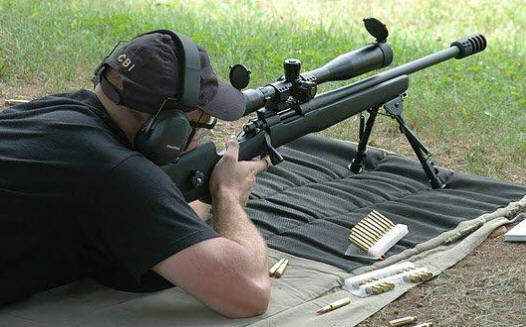 Field tests have also shown that the overall vertical dispersion is reduced over after market muzzle brakes using the same load. The CoreBrake™ Clamp-on muzzle brake comes in high quality 416 Stainless Steel and Aircraft Aluminum 7075 T651 construction. The Aircraft Aluminum construction weights only .20 pound which makes it ideal for AR 15/10 and hunting applications. Made in Canada by CORETAC SOLUTIONS INC. 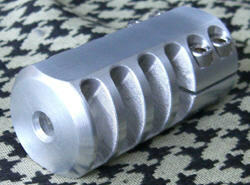 Shipping: All Custom Clamp-on Muzzle Brake orders ship in 4 weeks from receipt of order. Please provide precise information (minimum 3 decimal point - E.G. .870) as this is a custom muzzle brake for your specification and there is no "refund". Significant improvement in recoil reduction, eliminates virtually all muzzle rise, maintains straight rifle tracking and increases target reacquisition , a superior brake and CANADIAN made.